Elizabeth Coyne is represented by the Carrie Haddad Gallery in Hudson NY & the Judy Ferrara Gallery in Three Oaks Michigan .She has been a working artist for more than thirty-five years. She has Masters of Fine Arts in painting from the Rochester Institute of Technology in New York, a B.A. in fine arts from Purdue University and has studied and lectured at the Art Institute of Chicago. Ms. Coyne has exhibited her work in solo shows in Chicago, New York, Massachusetts, Vermont, and Michigan. Her work has been featured in group shows in Germany, Canada, New York City, Milwaukee, Ohio, Michigan, Pittsburgh and Washington, DC. Ms. Coyne's paintings are included in many private & public art collections. Over the past twenty five years she has won many awards and has been featured in publications such as Architectural Digest, the Chicago Tribune, the (Chicago) Reader, Windy City Times and many other publications. In addition to her painting, Ms. Coyne has held studio art and teaching positions at Williams College in Massachusetts. At Williams College, Ms. Coyne worked with Thomas Krens the provactive former director of the Solomon R. Guggenheim Foundation in New York. 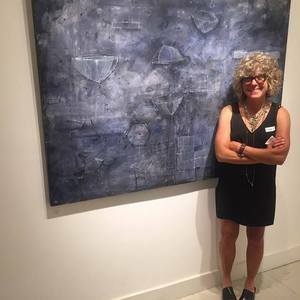 More recently, Ms. Coyne has been teaching at Lake Michigan College and Southwestern Michigan College, while exhibiting her work in Chicago galleries. She has been a visiting artist and lecturer at the Art Institute of Chicago's Ox-bow Summer program in Saugatuck, Michigan.